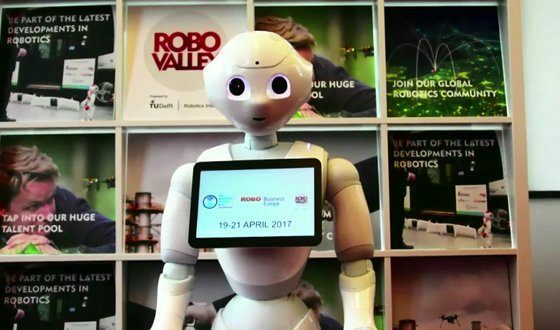 RoboBusiness Europe and TUS Expo, in collaboration with RoboValley, are organising the first edition of the International Robotics Week, which will run from 19-21 April 2017 in Delft and the metropolitan region of Rotterdam-The Hague. The International Robotics Week unites the RoboBusiness Europe, TUS Expo and ROS Industrial Summit trade fairs and conferences, making it one of the largest robotics events in the world. More than 4,000 visitors are expected from across the globe. The conferences will be held at the World Forum in The Hague, and there is an extensive program of events in and around the city of Delft. There will be visits to various labs, including those of TU Delft (Delft University of Technology) and ESA (the European Space Agency), as well as demonstrations at different field labs in the Rotterdam-The Hague metropolitan area. The demonstrations include drones and intelligent vehicles at the former Valkenburg airfield in Katwijk and aquabots at RDM Rotterdam. In addition, a range of activities are being organized in the city of Delft itself and on the TU Delft campus. "With RoboValley as strategic partner, there is a unique opportunity for the Netherlands to showcase itself as center of robotics and a truly innovative nation." The strategic partnership with RoboValley, the international robotics platform that has its origins in the TU Delft Robotics Institute, gives the organisers access to high quality knowledge and an extensive international network of experts. Read the full press release here, both in English and in Dutch.